This post brought to you by Sargento. The content and opinions expressed below are that of Cookistry. I absolutely LOVE making biscuits. They're like instant bread. And these are super-easy - you don't even need a biscuit cutter! With the holidays coming up, these are perfect for breakfast when you have guests - they'll be amazed that you made your own biscuits. These would also be great for mini sandwiches or just a little snack. This post is sponsored by Sargento, and they asked me to create a recipe using one of their shredded cheeses. I chose the fine-cut sharp cheddar from their Off the Block line of cheese, first because of the color. I had been brainstorming ideas, and I decided that a bright, cheery orange cheese would look really good in a recipe. Once I decided for sure that I was making biscuits, I knew I wanted small bits of cheese rather than larger chunks, so I was pretty happy to find the fine-cut shreds. And of course, cheddar has a lot of flavor. I love all kinds of cheese, but even when I've stocked up on all kinds of fancy stuff, there's usually some kind of cheddar on hand. Put the self-rising flour in a bowl and add the salt, sugar, cheese, and ham. Give it a stir to disperse the cheese and ham throughout the flour. Grate the butter directly into the flour mixture using a coarse grater . The easiest thing to do is to freeze a whole stick of butter, then unwrap and re-wrap the stick so that only 2 tablespoons are left wrapped. That way, you know when to stop grating and you've got a little bit to hang onto as you grate. Just make sure you don't grate the wrapping into the biscuits. As you grate, stop now and then and mix the butter in so it distributes through the flour before it has a chance to clump together. Add the buttermilk and stir until the flour is all moistened. If you have dry spots, add more buttermilk, as needed. If it seems wet and a little sloppy, don't worry about it. Flour your work surface and turn out the dough.Flour the top of the dough as well, just to keep it from being too sticky. Use your hands to pat the dough to form an evenly-thick square about 12 inches square. Fold the dough in thirds, like a letter, then fold in thirds in the other direction to form a fat square. TIP: You don't need to measure 12 inches exactly. You know how big an 8 1/2 x 11 standard sheet of paper is. Try to make the sides of your dough about the same size as the length of that paper. It will be close enough. If the dough is still sticky, flour your work surface and the top of the dough again. Pat the dough down to form a 12-inch square again. It doesn't need to be exact. Fold as before. This time, pat the dough to form a 9-inch square. Again, you don't need to measure precisely - it should be about the width of that imaginary piece of paper. If you want taller biscuits, feel free to stop patting and make a smaller square of thicker dough. Using the sharpest, longest knife you have (or you can use a rolling pizza cutter if you have one) cut about 1/2 inch off the outer edges of the square. Having a cut edge will help them rise properly. When you cut, don't saw like you're slicing - you want to cut straight down. If the knife is curved, you can rock it so you cut all the way through. Just don't saw. Now, cut the dough in thirds in one direction, then in thirds in the other direction, like you're cutting a tic-tac-toe pattern that creates 9 square biscuits. Or, if you want smaller biscuits, cut in a 4x4 pattern to make 16 small biscuits. Arrange the biscuits on the prepared baking sheet. If you leave them very close together - barely touching - they will have soft sides and tend to rise just a little higher. If you spread them a little further apart on the pan, the sides will be more brown and crisp. Gather up the scraps from the edges you cut off and form them into biscuits of whatever shape you like. 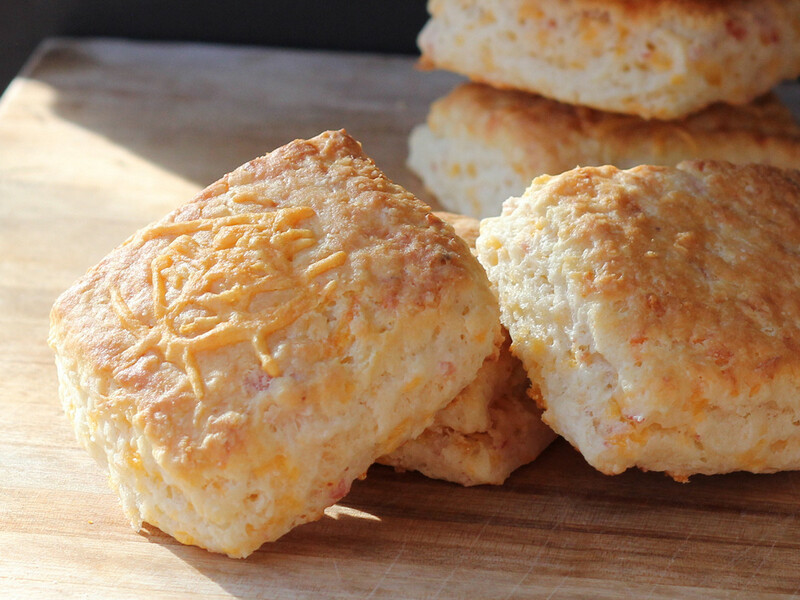 Bake until the biscuits are nicely browned, about 15 minutes. Optional: Before baking, you can brush the tops of the biscuits with butter or milk, or sprinkle a little extra cheese on top. Or, if you don't want to bother with melting butter to brush onto the cold biscuits, bake the biscuits for about 10 minutes, then rub the tops with the remaining nub of butter, then continue baking. Do you think YOU could create a recipe using a shredded Sargento cheese? They're holding a contest on Facebook where the winner will receive $2,000 toward kitchen supplies and ingredients for the perfect holiday meal, plus a year’s supply of Sargento Shredded Cheese. Just submit an original recipe and photo of a dish featuring a Sargento Shredded Natural Cheese variety, plus an explanation of why using real, fresh-tasting ingredients like Sargento Shredded Natural Cheese matters to you. Look for Sargento on Facebook to submit your recipe. Want more cheese? You can also find Sargento on Pinterest.